An exhibition of Japanese art at Dublin’s Chester Beatty Library has been opened by Her Imperial Highness Princess Takamado of Japan. The centuries old picture scrolls were bought by Chester Beatty on a visit to Japan in 1917. The library received support from Japan in preserving the scrolls which are regarded as one of the finest collections in the world. 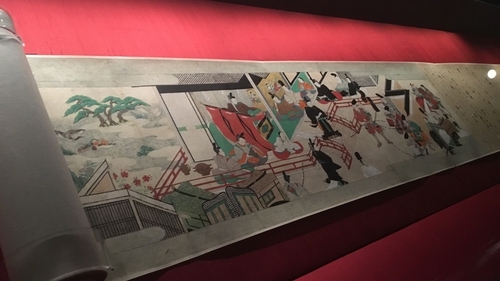 A highlight of the exhibition is an exquisite scroll depicting scenes from the Tale of Genji - a masterpiece of Japanese literature. It details the romantic exploits of the fictional Prince Genji, and was written during Japan's Heian period by a lady of the imperial court known as Muraski Shikibu. The four-set scrolls at the library were written by calligraphers of the highest rank including a brother of a Japanese emperor in the 17th century. During a visit to Ireland in 1985, His Majesty the Emperor Akihito was so taken with the scrolls that he offered the conservation services of Japan's Imperial Household Agency to restore them. The conservation took a year to complete and the scrolls were returned to the Chester Beatty Library. Princess Takamado, who studied art and culture at the University of Cambridge and Osaka University of Arts in Japan, took great interest in the pieces and was impressed with the library's collection. Fionnuala Croke, Director of the Chester Beatty Library, expressed the library's appreciation for the support it has received from Japan in the areas of conservation, research, publication and digitisation. She said: "One hundred years or so ago, these scrolls charmed Beatty to collect them. Today, we can all share in that sense of wonder, as we take pleasure in the stories that they tell." This year marks the 60th year of diplomatic relations between Ireland and Japan.